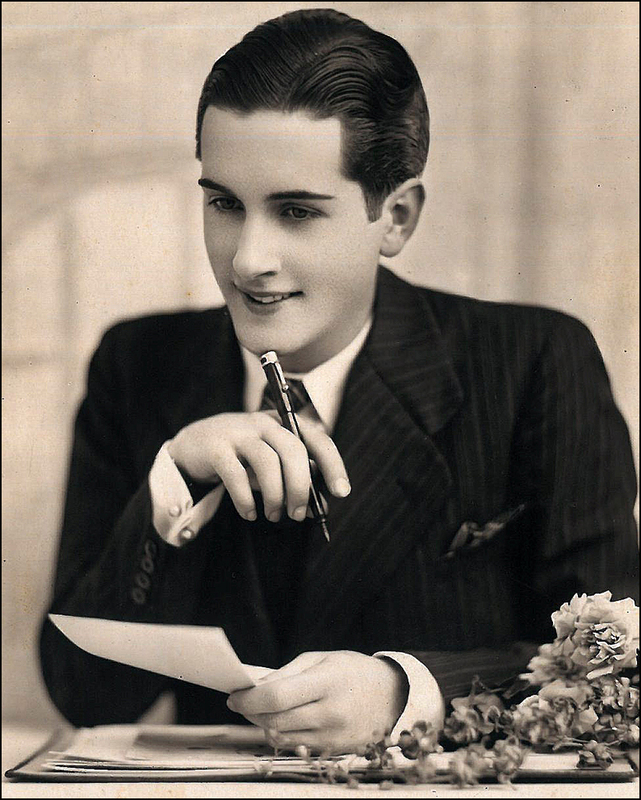 In giddy anticipation of film director Baz Luhrmann’s upcoming ritzy, glitzy retelling of “The Great Gatsby,” let’s give a nod to the original king of the shindig! That’s right. 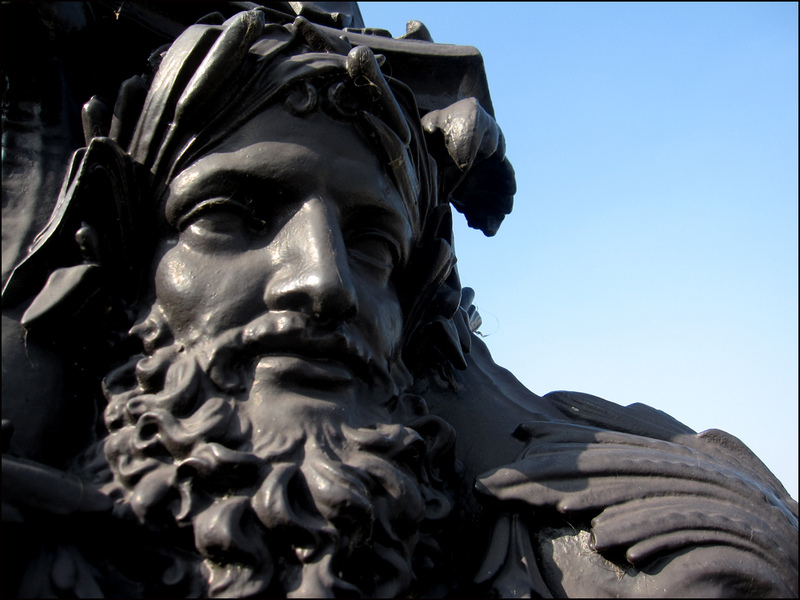 This week, we’re winding it back to party down in the garden of the dashing King Henri IV. Grab your beaded glad rags and galoshes, too. Spring has sprung in Paris, so with arms tangled, let’s roll on over to the centuries-old romantic hot spot, le Square du Vert-Galant at the tip of the Île de la Cité. 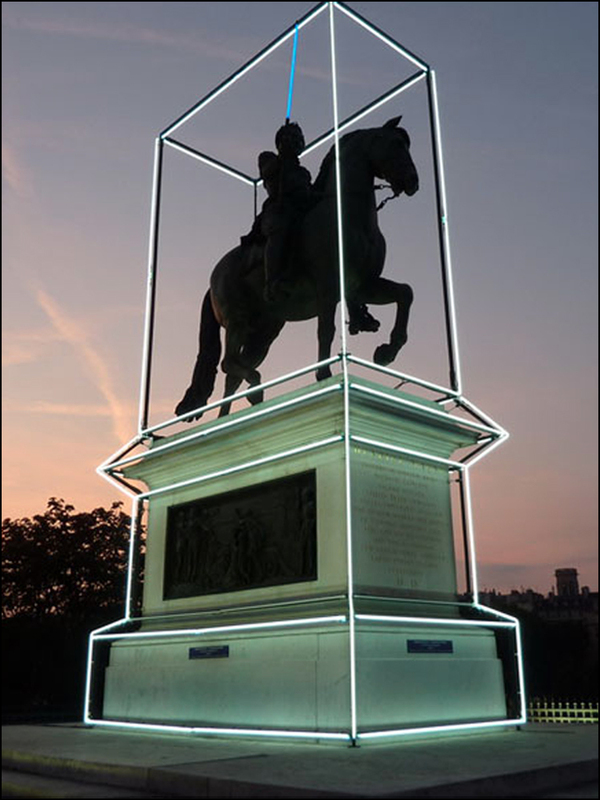 Created by passionate King Henri IV, its spectacular view of la Seine and currents crashing into its banks still move the rendezvous-ers, so hold on tight while I straighten the back of your frock coat collar. Follow my plume: The Saint-Michel Métro stop will allow for a little bouquiniste browsing as we make our way. Along with a book, we’ll pick up a dough-so-filling crêpe fromage. I’m not the first to propose the Île de la Cité as the perfect spot for a little picnicking, and I certainly won’t be the last. By the way, the bouqinistes have been pushing their wares along the Seine banks since the 16th century. Politics, fashion plates, and leather bound erotica still reign here. Looking curvaceous and fabulous at 406-years-old, the “New Bridge” is actually the oldest standing bridge in Paris. Created by Henri IV, it was the first bridge in the city to be built without houses or shops (i.e., “firetraps”) lining the spans. During the bridge’s construction, it became popular for young daredevils to jump from rampart to rampart. Following suit, even the King made the leap after hearing about the craze. Sadly, more than a few men fell and drowned. 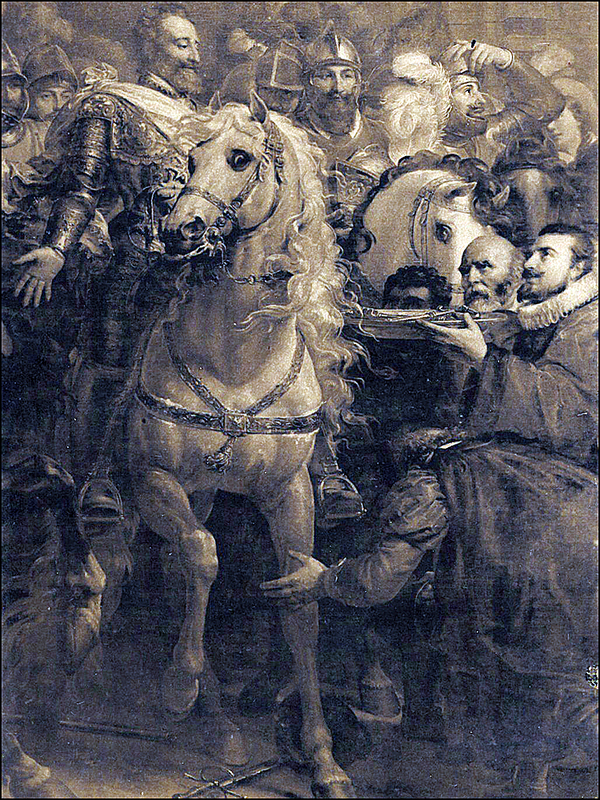 When this tidbit was reported to Henri, he quipped, “This may be so, but none of them were kings.” Touché, King Henri. And well done, you. Henri was also the king of the original urban re-do. 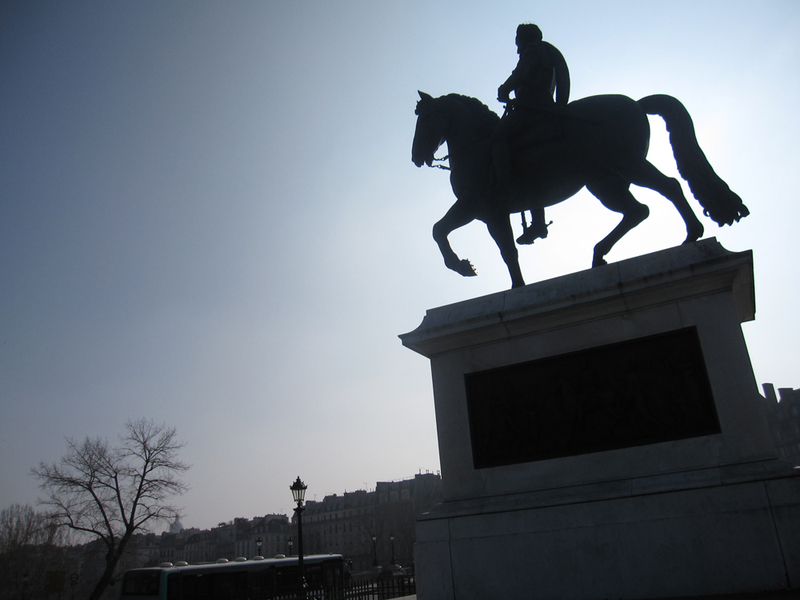 He not only banned timber construction throughout the city, but he also promoted symmetry in its public architecture, connected the Tuileries with the Louvre, and created Paris’s first city square! Thank Henri’s Place des Vosges for getting the party started in the Marais. Even today, the square is still a prime place to see and be seen. So pinch your cheeks and rouge the knees. As we promenade across the bridge, we’ll stop and cool our heels in one of its nook-like bastions. Originally these niches were created for the safety of pedestrians seeking to avoid being run over by passing carriages madly clattering by. Street vendors, entertainers, and thieves also set up shop here. Today, they’re the perfect spot for lip-locking, picture taking, and retrospection. The shapely bridge blends so well with the river that the eye can’t always separate the organic from the man-made. Its resulting beauty both soothes and re-energizes my spirits every time. The bridge cuts across the island connecting the Right and Left Banks of the river. 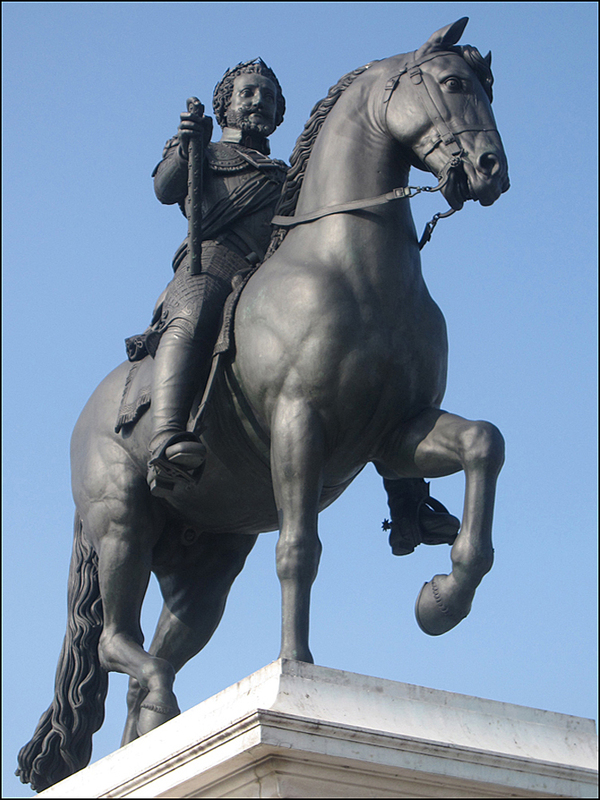 In its very center, you’ll find a huge bronze statue of Henri IV on horseback. Some folks consider the square around it the very center of Western Civilization. I don’t know about that, but I can vouch for it as a great place to make momentous decisions. See, this is where my beau proposed to me. (I accepted.) You’ll find the King’s garden directly below. Just follow the steps. 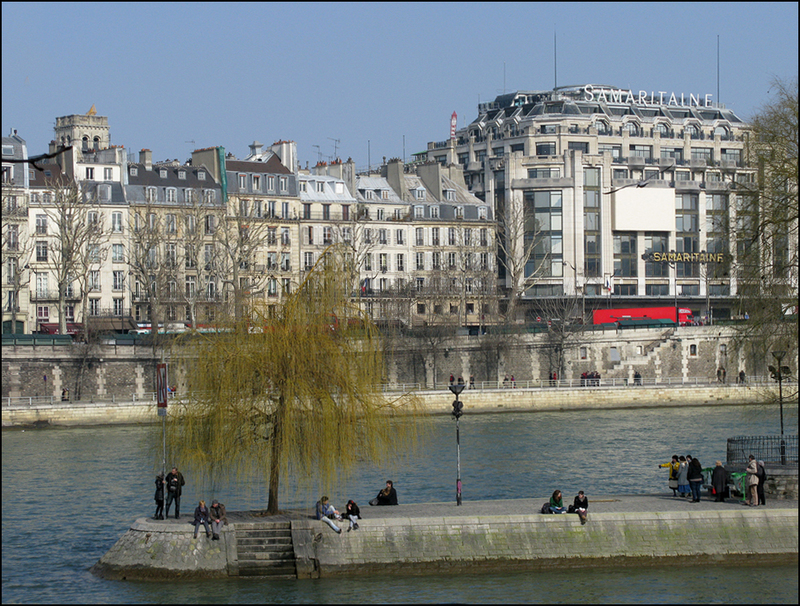 Just beyond le Square du Vert-Galant, you’ll find the downstream tip of the Île de la Cité. 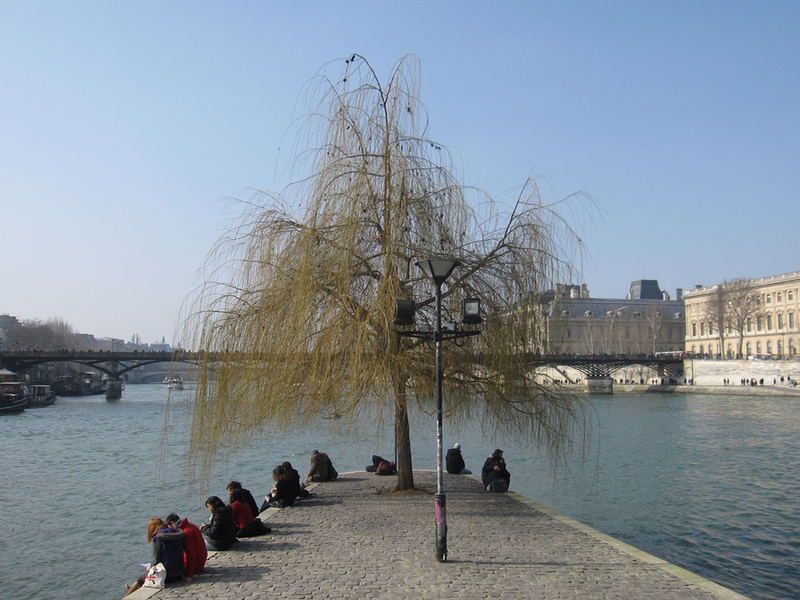 Pick a spot on the stone ledge for some smooth bateaux-cruise watching from underneath the weeping willow—the first tree in Paris to leaf out each spring. Listen hard for King Henri’s laughter and soft music, faint and pleasant, as the Louvre, Notre Dame, and Samaritaine rise above the pea green river, twinkling like stars among the whisperings, pink clouds, and bubbly champagne. Bookworms, ignite. Desire more time travel? Checkout the nearby Shakespeare & Co. at 37 rue Bûcherie. Located in a former 16th-century monastery near Notre Dame, it’s my favorite bookshop in the city. A favorite Beat Generation haunt, the late, great George Whitman opened the Bûcherie location in 1951 under the name of Le Mistral. He changed its name to Shakespeare and Company as a tribute to his friend Sylvia Beach after she closed up the original shop by the same name, which had been a few blocks away. (Sylvia also inspired Hem, Henry Miller, Anaïs Nin, James Joyce and yes, F. Scott Fitzgerald—just to name a few. “The lights grow brighter as the earth lurches away from the sun, and now the orchestra is playing yellow cocktail music, and the opera of voices pitches a key higher. Suddenly one of the gypsies, in trembling opal, seizes a cocktail out of the air, dumps it down for courage and, moving her hands like Frisco, dances out alone on the canvas platform. A momentary hush; the orchestra leader varies his rhythm obligingly for her, and there is a burst of chatter as the erroneous news goes around that she is Gilda Gray’s understudy from the Follies. The party has begun.” Yes, the party has begun. 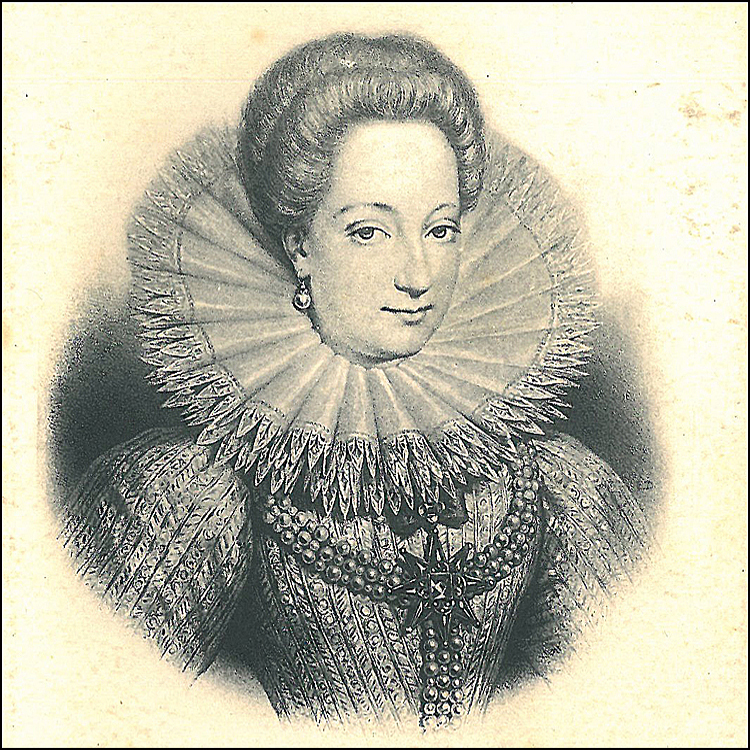 The Annick Goutal Beauty Institute in Paris has a deep facial and neck massage called the “Gabrielle d’Estrée.” Oh, la la. Rouge pots clatter across the mirrored vanity. I’m straightening the seams on my green silk stockings. Sliding into the ruby slippers.The picnic basket, our moveable feast bursting with edible treats and bottles of Madam Clicquot’s finest waits by the door. An early start is required if we are to follow in the fascinating footsteps of Theadora on this marvelous first of May morning. XXOO V.
YES. Veuve Clicquot is perfection, Virginia! And what an interesting history. Perhaps it’s time for post about Champagne. I’m now in the process of tracking down Tilar J. Mazzeo’s “The Widow Clicquot.” According to The New York Time’s review, Madame Barbe¬Nicole wrote to her great-grandchild, “The world is in perpetual motion, and we must invent the things of tomorrow. One must go before others, be determined and exacting, and let your intelligence direct your life. Act with audacity.” I love this quote! Thanks for the brainstorming! I love the green stockings and ruby slipper combination. Seams are still in vogue, I do believe. And I’m certain that our globe-trekking Tin Man friend would also approve! Mmmmm … crepes. I ate way too many of those during my too-brief sojourn in France! Not that one can ever eat too many crepes – so good. I too am looking forward to watching The Great Gatsby! So true! Have you tried making your own? And YES. The Great Gatsby looks fabulous. Great soundtrack, too! For inspiration, I found two fine Julia Child clips. Subject? Crêpe Suzette! Bon Appétit! OUI! A Theadora guidebook to Paris is a must. Nowhere is one able to discover such intimate details of your magnificent city shared with a sense of fun that simply demands the reader make plans to visit at the first possible opportunity. Fabulous city. Fabulous. Writing. Ah, Patricia!! You made my week! As always, I appreciate your support and kind words. I’ve been thinking about creating a little Paris guidebook. I’ll keep you posted! And by the way, I recently ordered your “The Promise of Provence.” I’m looking forward to reading it! 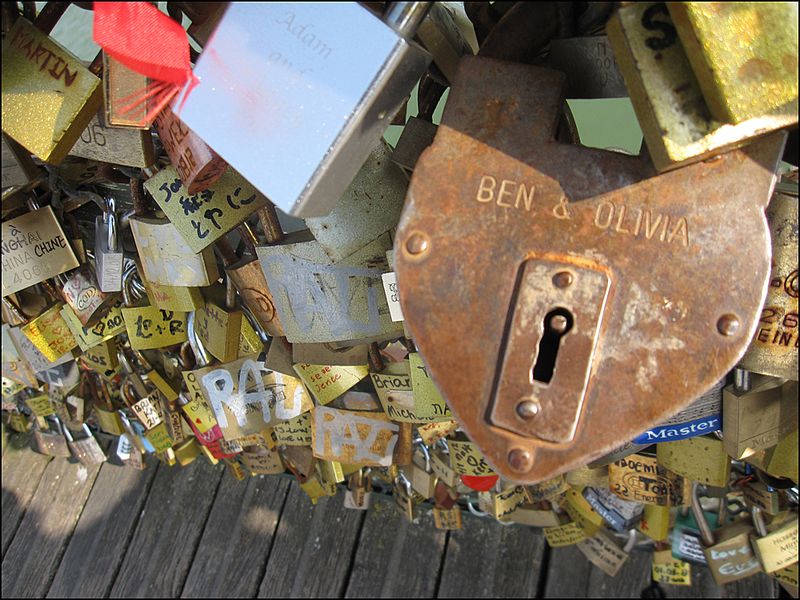 T.
I recently placed a lock on the Pont des Arts, as a symbol of my love for this magnificent city! Nice, Kim! Where did you attach your lock? Did you save the key? Did you write a message? Questions, questions! T.
It has my name and a heart on it – tout simple et non, I didn’t save the key. From the left bank, it’s on the righthand side with the thousand other locks! Oh my, I must hurry if I am to catch up with Virginia! I have some tins of pâté and a bottle of Clicquot, as well. Our Theadora proposed to in the shadow of a King………should have known, hoe delightful. Greetings to you from Malta. We are having a lovely holiday and are off to Sicily in the morn. Hurry! Hurry! Virginia and I are waiting for you. We’re sitting on a bench on the Pont des Arts. Virginia is wearing green seamed stockings and ruby slippers and I’m wearing my beloved Roger Vivier evening pumps in turquoise blue. I almost tripped over the long beaded tassels! Malta? Sicily? Goodness. What a fast-moving yellow brick road. Enjoy! Again, I’m looking forward to your reports. Big hugs and safe trekking, T.
Loved this one! 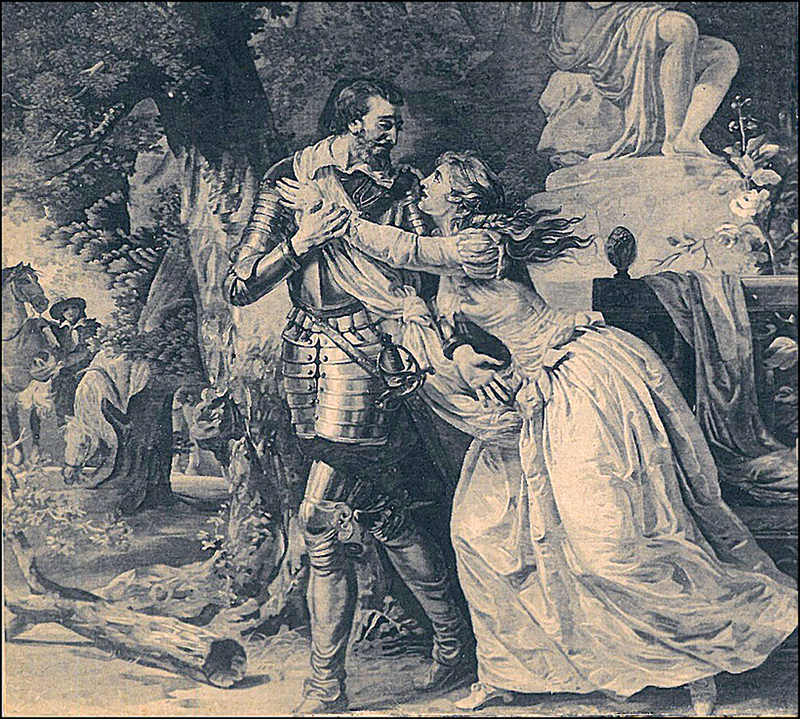 Being a Paris history nerd I really enjoy Henri IV’s story; he was such a pivotal figure in Paris, and he certainly loved life as well as the ladies…to a fault sometimes (before his assassination he was geared up to start a war over a mistress who went off with another nobleman). Well done Theadora, keep up the good work! If there was a “Paris By Theadora” guide book, I would buy it! I would give copies to all my relatives, too! You must, simply must do it! Seriously!!! Blushing. Blushing. Thanks, Martino. I appreciate the push! T.
Another fantastic blog. I, too, can’t wait for the Great Gatsby film. I just finished re-reading the book in preparation. MERCI. I also just finished re-reading the book, along with Matthew Bruccoli’s “Some Sort of Epic Grandeur.” Wonderful pairing. Perfect outdoor springtime reading! I’m also looking forward to the soundtrack. Especially Bryan Ferry’s two jaunty numbers! T.
Thanks for spreading the word!! Another great post! I love it! Even my two sons are as excited about seeing the Great Gatsby. It’s great to see an artistic movie that appeals to so many people. I believe this is going to be another BIG movie for Leonardo Di Caprio, and I can’t wait to see it. Also, I agree with many of my fellow commenters, you should write a book about Paris, and I would definitely purchase it. You are such a wonderful guide to everything Paris and living life well! Karen, I really appreciate the support and swell words. Your positive energy is contagious. Thank you! So your sons are excited about the film? Very cool! Have they read the book? Will you attend as a group? And YES. Leonardo Di Caprio is looking pretty darn handsome. He looks very comfortable in the role. Well, at least in the trailer! Have you seen the Robert Redford-Mia Farrow version? I’d like to see George Cukor’s 1926 film with Lois Wilson and Warren Baxter. I think the film was lost but trailer exists somewhere. Sigh! Ace post, T! I really enjoyed learning about Henri. Don’t think they make kings like that anymore. Your photographs so make me want to come to Paris. It’s a cliche but Spring is lovely in your part of the world. Thank you, Richard! I’m looking forward to “The Great Gatsby” soundtrack. Our pal Bryan Ferry and the Bryan Ferry Orchestra have two numbers on it: “Love is the Drug” and “Crazy in Love” with Emeli Sandé. Let me know what you think. Yes, Love is the Drug is great in this new version – he should do an album of his own covers. Thanks, T! I am saving up to book in for one of Annick Goutal’s deep facial and neck massages. Beautiful meanderings through Paris once again Theadora, thank you! Thank you, Patti! I’m with you! The Annick Goutal salons are so pretty. They cost a pretty penny. Of course, the “Gabrielle d’Estrée” is the most expensive (145€). I’m not surprised! Here are the other treatments Perhaps I’ll save up for the “La Reine Margot” ?! I do like crepe, and eat it quite often. Beautiful pictures. Love this post. I’m always wishing to get back to Paris– but now even more… thanks. I love your writing and your photos, Theadora! They both add another level of appreciation to this city I already live in and appreciate! Huh .. I guess I have to move back to Paris 🙂 Square du Vert-Galant is one of my favorite places in Paris. A historic place where the Grand Master Jacques de Molay was burnt. That crepe looks amazing. Reminds me of a special time I spent in Paris in 2003 and enjoyed crepes in a small cafe near Monmartre. Ah, Mlle B.! Though it is four days since I turned into ‘La femme vielle’, this post is the most marvelous gift an old gal could get! I ran to the bookshelf to find my crepes recipe (haven’t made them in years! )..and the flour is sitting out on the counter, warming up (because it’s kept in the freezer to prevent the ‘little buglies’ from getting at it! 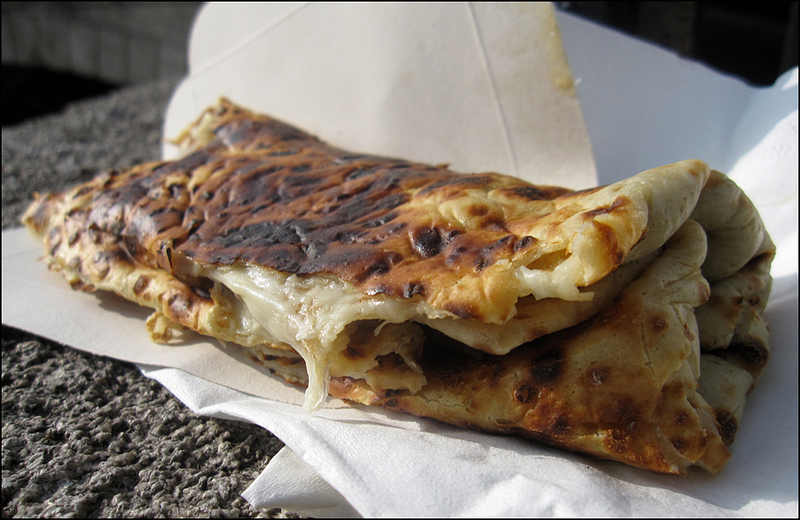 )…I’ll be making a batch in a bit, due to my extreme salivating at your mention of ‘Crepes fromage’! 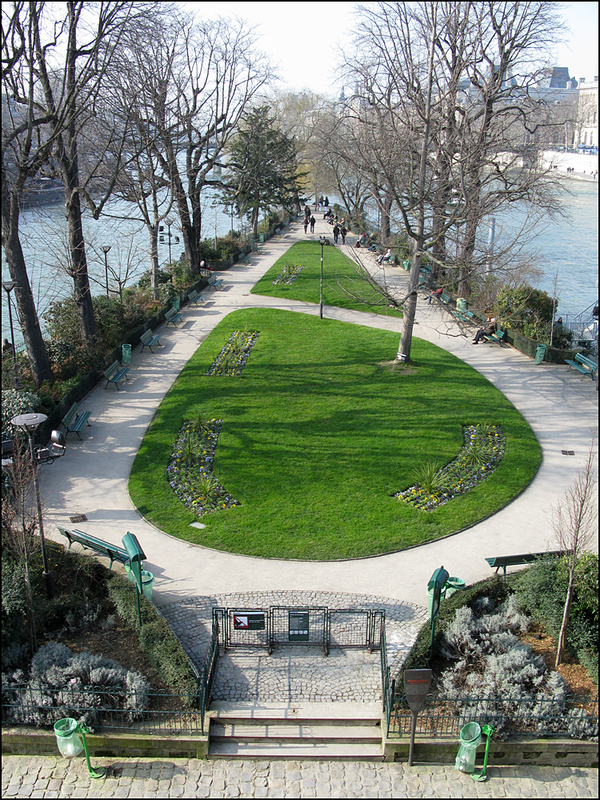 I never knew of the little park at the tip of Ile de la Cite…merci beaucoup! It looks so wonderful, a great place to people-watch and photograph! Le roi Henri Quattre was quite the guy…I know all Parisians must love him for his magnificent sense of design…seeing so much beauty around them every day, even in the rain! 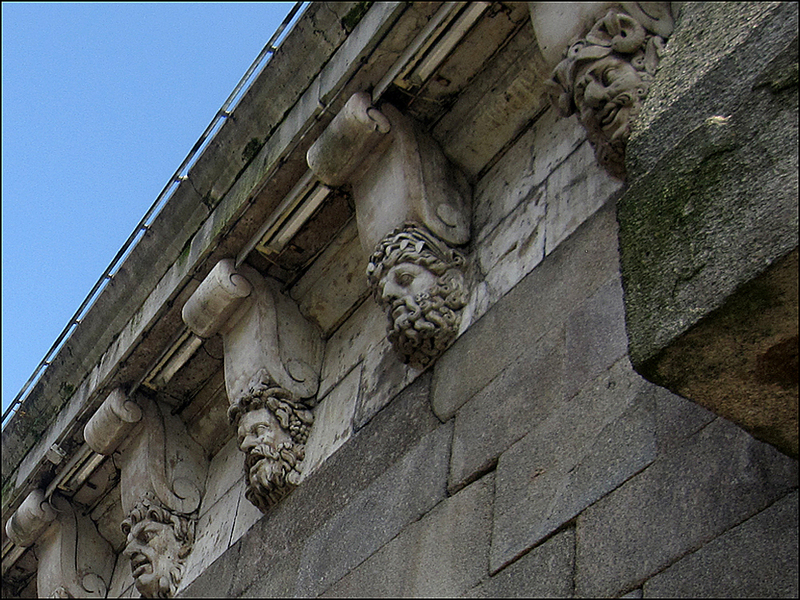 Just when I thought I was the oldest thing around still looking quite nice, you show me the Pont Neuf! 406 ans, vraiment? And not one application of ‘night cream’ or ‘moisturizer’? How glorious it is for you to roam the City of Lights, Mlle B., and present so much history–mind-boggling how you do it!!! I agree about you doing a guidebook. It would be fabulous. I love crepes, so that first photo made me hungry. 🙂 I laughed when I read “The Jolly Green Giant”. One of my friends in grade school called me “The Jolly Green Midget” because I wasn’t tall (at least compared to him) and like green. You’ve outdone yourself with this post, Theadora! The photos and the text, both outstanding! 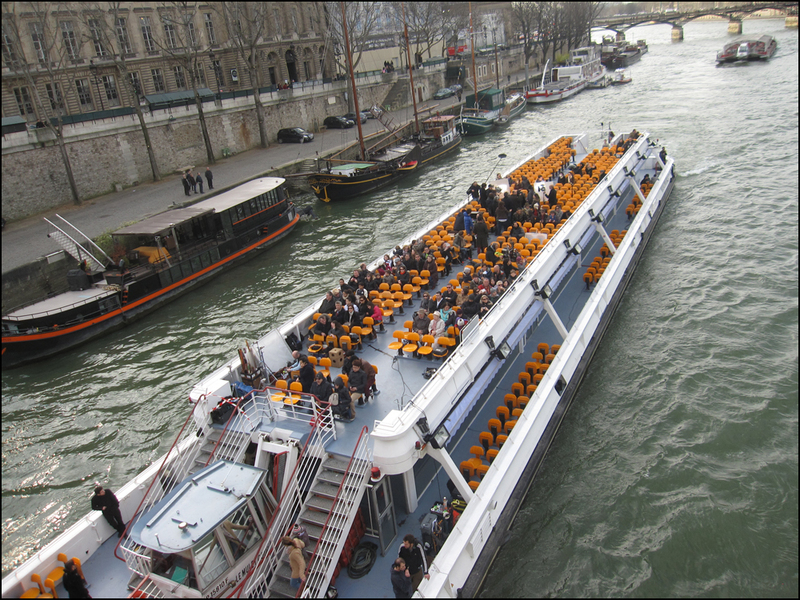 All the times I’ve been in Paris, on the Ile, always at the stern of the “boat,” never (I realize seeing your photos) at the bow! And now I’ll no more come again. No beating back against the current, the past is the past. Too bad Gatsby wouldn’t figure that out. Fortunately I have you to make it all alive and present again! 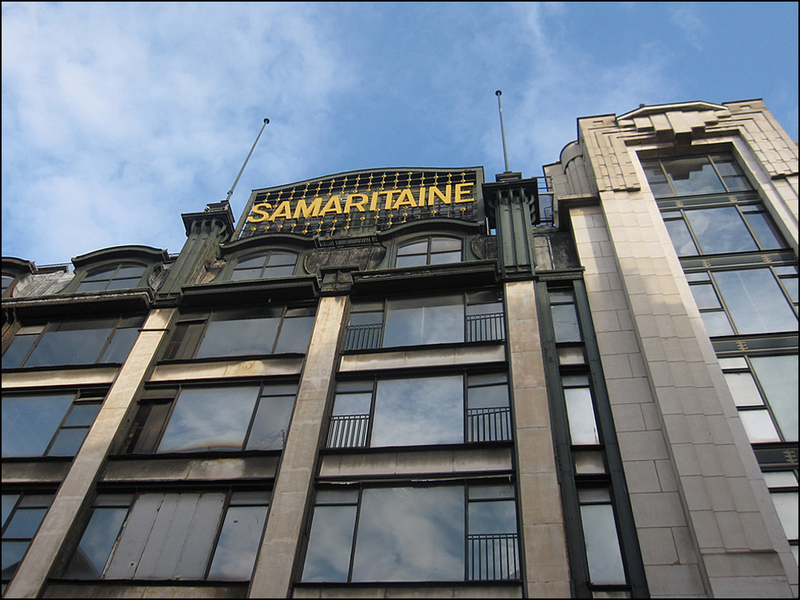 But why is the grand old Samaritaine closed? Forever? King Henri was quite the lad. And you have raised my appetite for Paris once again with your rollicking but lyrical prose. There is no question about it. You certainly have a book in you! In fact maybe E-Books. The crepe fromage looks too inviting. My mouth is watering. I’m imagining eating it while I flip through the pages of your book…..
*sigh, swoon, jealous! * Can I tell you how wonderful your posts are without being a broken record? Is it me or are you using more literary quotes lately? Love ’em! BTW — You’ve been living in Paris how long and you’ve never had a Nutella crêpe before! Are you just not a Nutella fan?